As a low moves up from the south into New England this afternoon, promising to bring a bit of�snow and ice�with it, the birds out my window are getting ready before darkness falls. I have rarely seen so much activity. A small flock of around 10 robins are hitting the holly berries and the rose hips hard, and tossing leaves in a leaf pile around like crazy, looking for bugs.�Juncos all around, and white-throated sparrows are scratching little pits in the garden mulch. A fat and handsome flicker came within two feet of my window, trying to get his beak into the half-frozen garden soil next to the foundation. Best of all, a Hermit Thrush. He was eating some of the holly berries, and generally poking around. Except for robins, the Hermit is our hardiest thrush. His rusty tail diagnoses him and, in summer, his song. 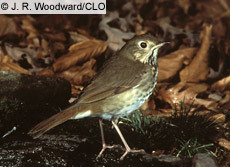 Read about the Hermit Thrush here, (CLO) from which the image is borrowed. THANK YOU FOR THE POETS! oh, jeez, I LOVE that. Never seen it before. It's a perfect little entire thing. A perfect little entire thing. AKA a Poem. Or a bird. "The bird's fire-fangled feathers dangle down." I love it. I love that nature gives us hope when man fails us. "An aged thrush, frail, gaunt, and small"
all by itself raises love and sympathy and one-ness with nature (blah blah blah). The rhythm and sounds in that line, regardless of content & meaning (anagedthrush-long pause-frailgauntandsmall), are like birdsong itself. Great stuff--where's it been all this time? This ranks up with my favorite of all time. I wrote a book in the late 90's about integrating the educational disciplines. Much too long to explain, but in the book (project) we had to gather poetry that spoke of humankind. "The Darkling Thrush" so blew me away that I had to include it. It is the masterpiece of man's existential nature put to rest by nature. How better to signify that than by the line you just quoted as the bird symbolizes man. Perfect poem is right. I had my class do this poem in choral reading for the end of the year award ceremony. The guys did one verse, the girls another, and at the end, they all joined in one voice. It was amazing. Makes my hair stand up to think of it.